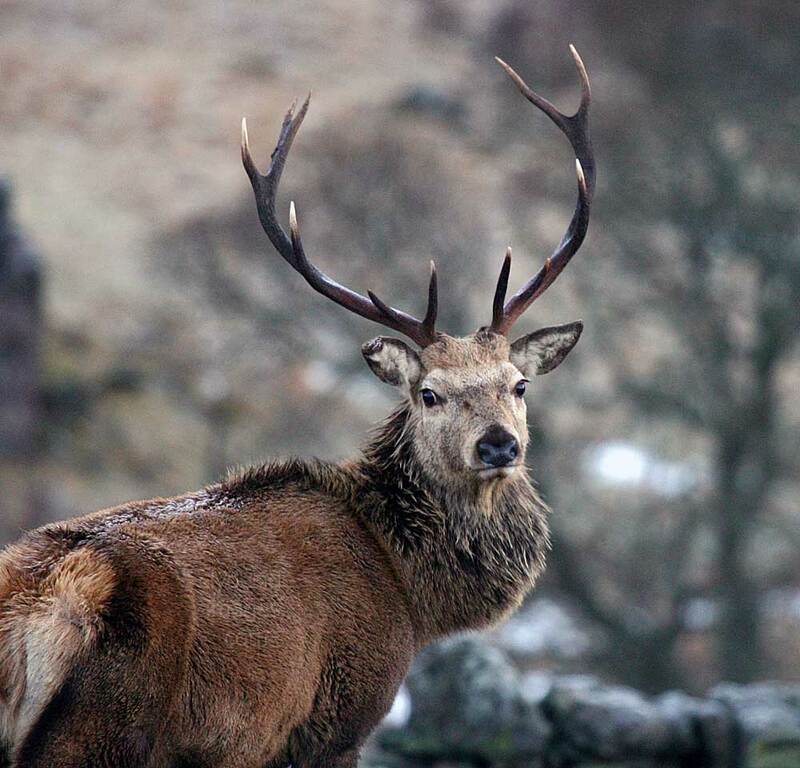 Hundreds of deer were down at the roadside between Braemar and the car park at Linn of Dee. It was cloudy with leaden skies but due to clear later. Not much snow despite it being mid-winter and very wet underfoot. I followed the good track up Glen Lui and another huge herd of deer was down at the river flats. Most were on the east side but others swam across through the fast flowing water to join the main group. 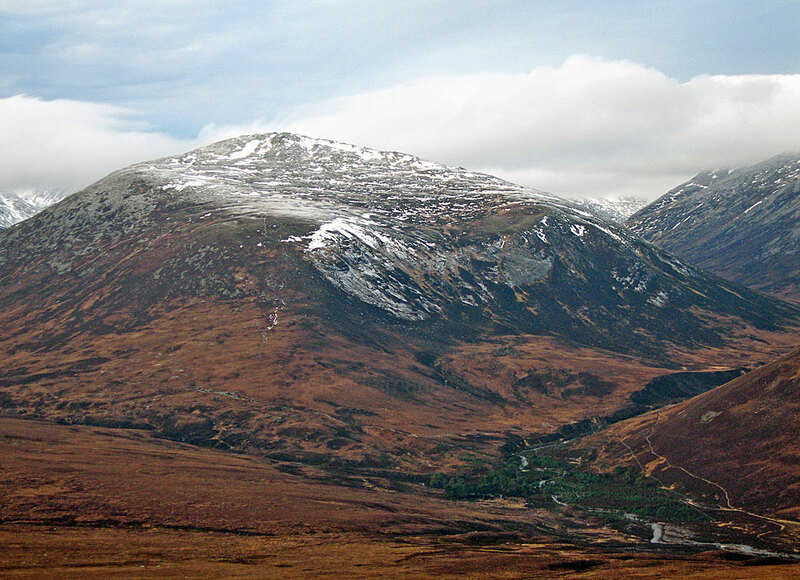 Once at the unoccupied Derry Lodge I took the Glen Derry fork and continued northwards. The water was now pouring off the hillside and flooding sections of the path. One drainage channel, now a cascading burn, required particular care while crossing. I took in Beinn Bhreac`s subsidiary top first then continued on to the main summit. 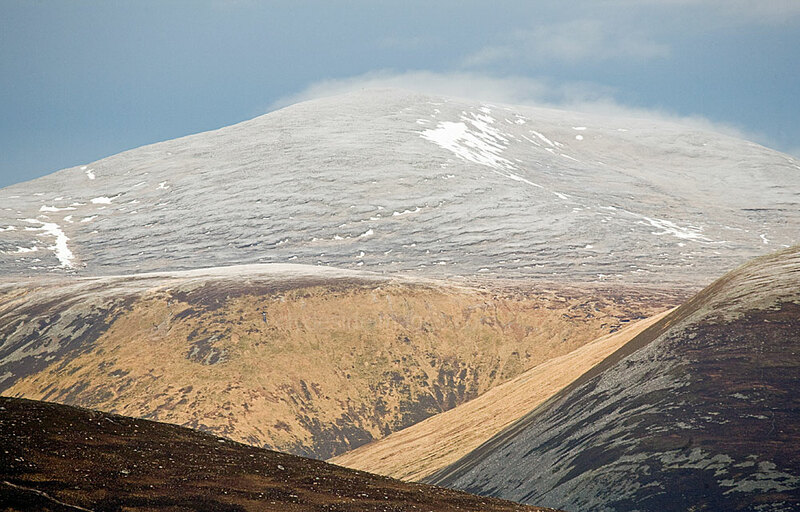 I`d originally considered adding Beinn a` Chaorainn to the list but the poor conditions put paid to that. I dropped back down to the track but this time crossed the bridge high up the glen to return by the track on the west side of the Derry Burn which was in spate. Just before I reached the car the sun belatedly put in an appearance. Driving back to Braemar I stopped above the River Dee which had now burst its banks. The extent of the rainfall was now apparent and the flat area bordering the river`s path had the appearance of a huge loch. Only the tops of trees and telegraph poles protruding from the water gave a clue to its true identity. Looking towards the Lairig Ghru from Beinn Bhreac. 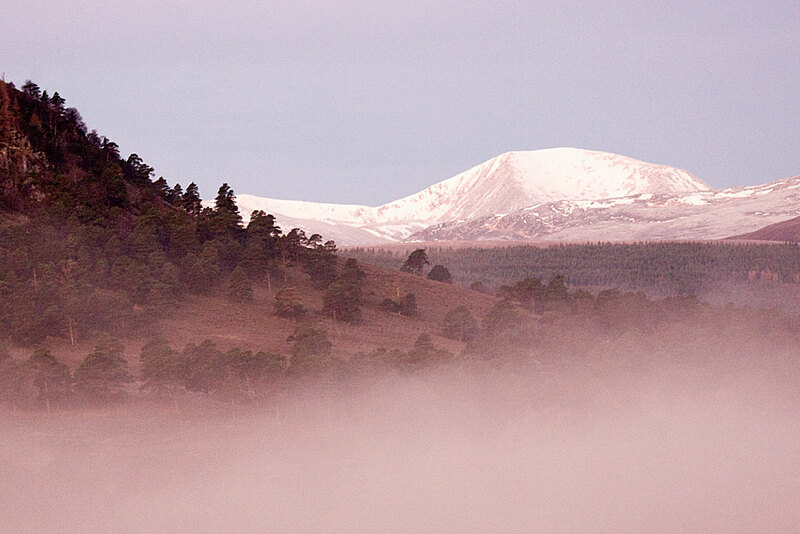 ​Beinn a' Chaorainn from the south. From the Linn of Dee I walked-in via the good track on the north side of the river to White Bridge then turned nothwards and followed the Dee towards the Lairig Ghru. Several F-16`s flew overhead. I didn`t come across any other walkers, only a couple of mountain bikers, one of whom, an Irish guy, asked me if I`d seen his watch which he`d lost on the track earlier that day. As I made my way onto Carn Cloich-Mhuilinn, the southern subsidiary top of Beinn Bhrotain, things looked gloomy. Spots of rain began to fall just as I left Monadh Mor and the cloud closed in. 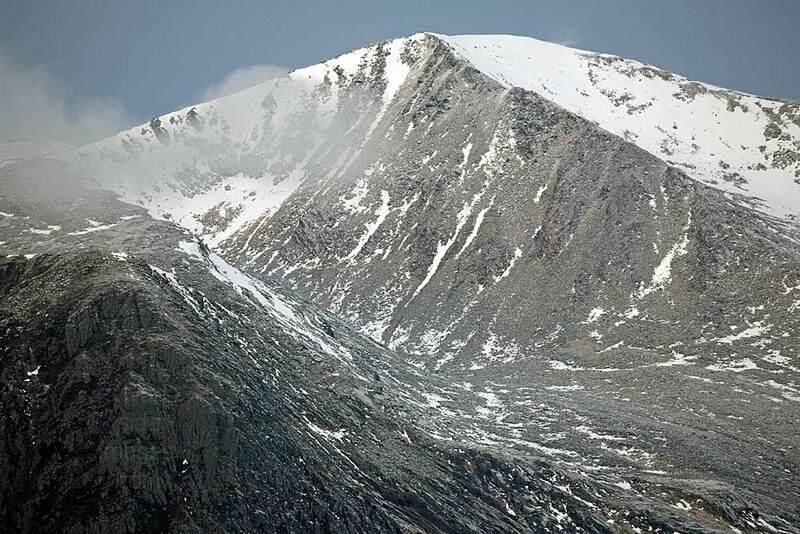 I took a bearing for Loch nan Stuirteag and from there headed for Sgor an Lochain Uanie, the Angel`s Peak of Cairn Toul. This former subsidiary top was included in the 1997 promotion parade and is now classed as a Munro. Despite the fact that it was mid-summer, the circuit of the corrie had a wintry feel, with no view and no one else to be seen. 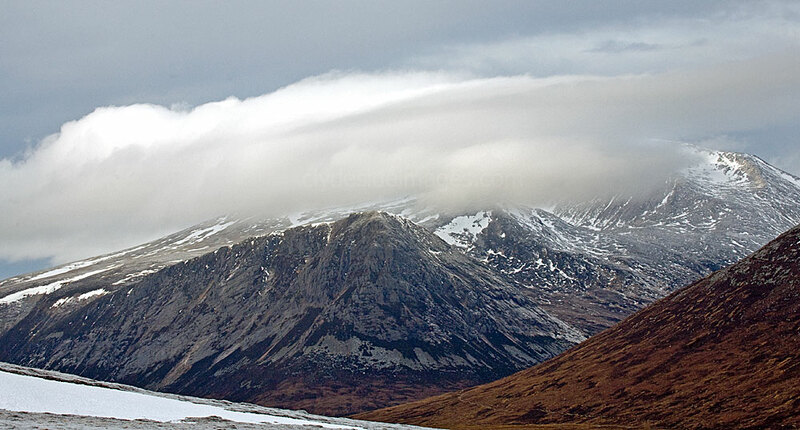 As I descended to the bealach from Cairn Toul, the clouds parted to reveal Carn a` Mhaim on the opposite side of the pass. Patches of blue sky increased and I pitched the tent just below the Devil`s Point. A group of hinds, apparently unconcerned by my presence, grazed close to the tent while fingers of cloud formed weird shapes and swirled above Corrour bothy in Glen Dee. Retiring to the tent, I read several chapters of Lonesome Dove by Larry McMurty before falling asleep. Early the next morning, after breaking camp, I made the short trip to the summit of the Devil`s Point. Blisters put paid to a possible ascent of Carn A` Mhaim so I made a direct return to the car. I stuck my head inside Corrour Bothy as I passed and was disappointed - it looked very basic and dirty. Return via Derry lodge. ​I set off from Linn of Dee and took in Carn a` Mhaim first. Excellent outlook across the Lairig Ghru to Cairn Toul and the Devil`s Point and I got a good view of where I camped on the bealach between these peaks almost two years before. 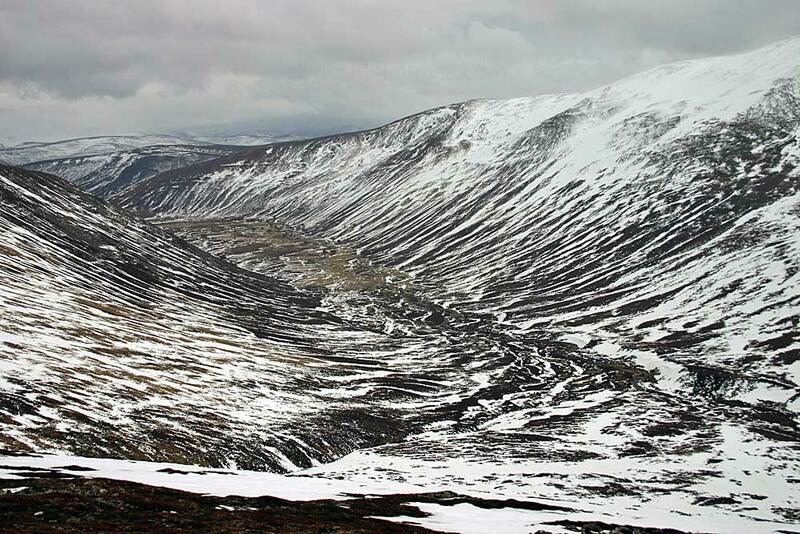 The Sron Riach ridge connecting Carn a` Mhaim with Ben Macdui was quite entertaining, as it was still holding large areas of snow on its east side. I was enveloped in cloud as I neared the summit of Macdui and the wind really picked up. Now in thick cloud on an extensive snow field, I was forced to don all my clothing, Balaclava included. I had my video camera with me and set it up to film myself crossing the snow here. Plodding through deep snow, I looked like Scott of the Antarctic - some would say a typical Scottish summer hill walk! 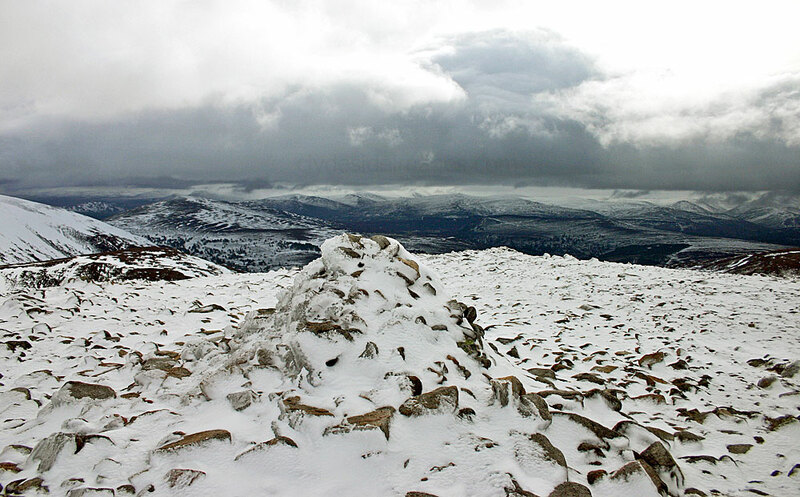 After doing all the subsidiary tops of Ben Macdui I returned over Derry Cairngorm (above? *) and as I descended from the latter hill the sun came out. The walk back through the Caledonian Pines near Derry Lodge was a fine way to end to the day. 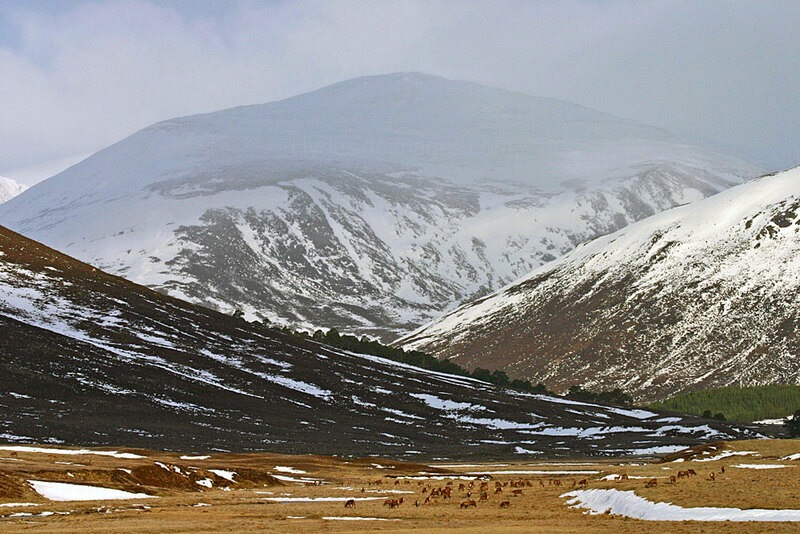 Looking east from the lower slopes of Sgor Mhor to the distant tops of Lochnagar and the White Mounth.